USC Law’s involvement fair kicked off on Sept. 8, the third week of school, with law students already eager for a respite from class. With tables stocked with free cookies, ice cream and candy during lunch break, student organizations prepared to sell their strong points and sweet-talk hungry students into jotting their names down on sign-up sheets. Ranging from Legal Aid Alternative Breaks, which takes students to the Gulf to provide legal and community service, to Phi Alpha Delta, a fraternity that annually hosts a beer-pong-for-charity tournament, the 37 organizations offer a plethora of choices. Joining an organization can bring students many benefits. The organizations can be especially advantageous to first-year students unacquainted with the demands of law school. “For first year students, these organizations are great resources because they’re unfamiliar with the social aspects and academic aspects of law school,” said Jimmy Chen ’12, Asian Pacific American Law Student Association academic co-chair. 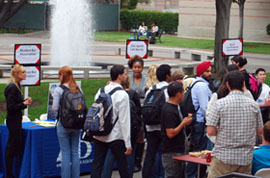 The clubs’ panels and networking events can help 1Ls become familiar with their fields of interest. Clubs’ focuses range from entertainment law to sports law to even art law. And the clubs aren’t all business—the Environmental Law Society organizes a camping trip while the Art Law Society will take its new members to the L.A. Art Walk this week. The professional clubs offer many students a real-world glimpse at classroom theories. The International Law and Relations Organization (ILRO) enables students to get an international perspective on law by pairing students with LL.M.s and lawyers who deal with international law. “It’s a good way to see how it happens in practice because you can learn as much as you want in law school, but it’s different to see how it is in the real world,” said ILRO treasurer Paul Moura ’12. In addition to learning opportunities, many organizations offer mentorship programs pairing first-year students with upper-division students. The Women’s Law Association is one such organization, pairing female 1Ls with older peers. Farfel is a supporter of the WLA mentorship program, having benefited from it. Her mentor helped her pick classes, handle classmates and even pick her summer job. Ethnic organizations also abounded. The Middle Eastern and South Asian Law Association discusses issues such as religious freedom and racial profiling in the wake of Sept. 11, said Brandon Kennedy ’12, the group’s president. Last year, they also paired up with the Asian Pacific American Law Students Association to host a Harold and Kumar-themed event. These organizations not only can instill practical skills, but also they foster a sense of belonging. Christine Capuyan said joining OUTLaw, a LGBTQ organization, helped her immensely. OUTLaw serves to bridge the gap between the straight and non-straight communities and offers volunteer opportunities at the L.A. Gay and Lesbian Center, which offers pro-bono clinics. Similarly, the Black Law Students Association serves to guide black USC law students. Co-president Amanda Smith ’12 said the biggest thing she gained from BLSA was comfort. And aside from promises of free sweets, mentorship programs and learning opportunities, there’s always the obvious reason to join. “We’re completely awesome,” said Andrew Quinio ’12, Federalist Society president.